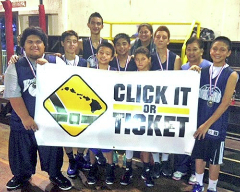 The HI-PAL Click It or Ticket Elementary and Intermediate School Championships were held this past weekend, March 8-9, at Carvalho Park in Hilo. The Waiākea Titans finished the tournament with a 4-0 record to claim the Elementary Division championship for 4th through 6th graders. Members of the Titans include Davin Amar Jr, Kiaʻi Apele, Makana Credo, Kawai Kiko, Shesley Martinez, Guyson Ogata, Chance Simeona, Cole Shiroma and Braedy Yamada. 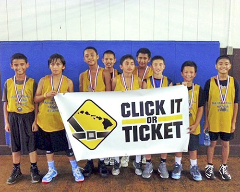 The Hilo Spartans defeated the Hilo Jr. Vikings 28-20 to take the Intermediate Division championship for 7th and 8th graders. Members of the Spartans include Kaukahi Alameda, Caleb Cabison, Derik Canion, Dan Gallego, Alex Hernandez, Simon Lafita, Holden Paiva, Camren Statler-Ellamar, Jamell Thompson and Jolim Vergara. 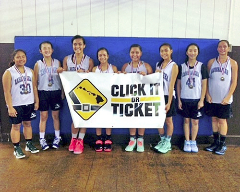 In the Intermediate Girls Division, Kamehameha upended Waiākea 27-17 to win the title. 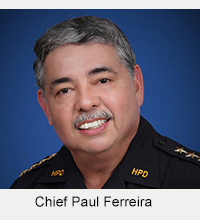 Members of Kamehameha include Trinity Alameda, Naveah Fukui-Stoos, Makenzie Kalawaia, Jaslin Kamaka-Mauhili, Jordan Mantz, Dominique Pacheco, Jasmine Pakele, Camille Poe, Hera Salmeron, Taylor Sullivan and Meghan Wong. 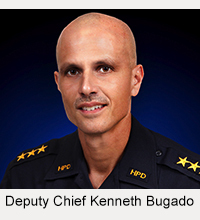 For additional information on any Click It or Ticket or HI-PAL event, please call Lieutenant Horio at 961-8121 or Officer Randy Morris at 326-4646, extension 258.